Nigeria's president, not seen in public since going into hospital in Saudi Arabia for heart treatment in November, has told the BBC he is recovering. In his first interview since then, by telephone, Umaru Yar'Adua, 58, said he hoped to make "tremendous progress" and return home to resume his duties. The opposition plans a rally to demand details of the president's health. Rumours the president was critically ill and unable to return to the presidency have been swirling around Nigeria. His adviser Tanimu Yakubu Kurfi told the BBC the president's enemies were behind the rumours. Doctors said in December that President Yar'Adua was suffering from acute pericarditis, an inflammation of the lining of the heart. He is also known to have kidney problems. 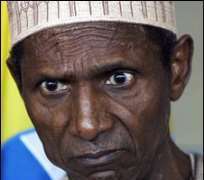 Speaking by telephone to the BBC in an interview organised by the president's office, Mr Yar'Adua said he was making a good recovery. BBC Hausa has a large audience in northern Nigeria, where Hausa is the main language. He gave no indication of when he might return to Nigeria. "I wish, at this stage, to thank all Nigerians for their prayers for my good health, and for their prayers for the nation." He also wished the Nigerian national football team success in the Africa Cup of Nations currently under way in Angola. The BBC's correspondent in Nigeria's capital, Abuja, said the president's voice had sounded weak. President Yar'Adua's silence until now and the fact he did not appoint Vice-President Goodluck Jonathan to serve in his absence have led to fears of a constitutional crisis. There is a perceived danger of a power vacuum in a country that only saw the end of military rule just over 10 years ago, the BBC's Will Ross reports from the capital, Abuja. There have also been complaints that important government business has been left hanging in the president's absence. The interview with President Yar'Adua was recorded late on Monday and first broadcast at 0530 GMT on Tuesday. It has been widely rebroadcast by Nigerian TV and radio stations. Many Nigerians will be relieved to hear the president's voice, says our correspondent, but calls to hand over power to the vice-president will continue. 5 January 2010: Two more court cases filed and a human rights group wants president declared "missing"
There are three different court cases under way calling for power to be transferred to Mr Jonathan, including one from the National Bar Association. The NBA says it will still press on with its case, despite the evidence that the president is at least well enough to speak. Under the banner Enough Is Enough, an organisation called the Save Nigeria Group has called people on to the streets of Abuja. They plan to march to the national assembly, where the president's health was due to be discussed as it resumes after the Christmas and New Year break. Dozens of police, including riot police, have been deployed in Abuja ahead of the rally. Prominent opposition politicians and lawyers, Nobel laureate Wole Soyinka and the Biafran secessionist leader, Chief Emeka Ojukwu, will be among the demonstrators. It is not clear if the demonstration will be well attended, our correspondent says. Nigerians may be worried about their absent president but whether they will take time off to demonstrate is another matter, he adds.